When I first moved into my mid-town Toronto condo I loved all the city things that were within walking distance: the subway, book stores, restaurants, cafés, movie theatres, food(ie) stores. These were the things that I missed most living in a U.S. suburb where you have to drive everywhere. One thing that I did love there was a huge, nearby park where I could walk for well over an hour throughout the year. But once I found it, there was no keeping me away. Not only do I walk there through all the seasons, I drag all our out-of-town visitors there – especially the ones who don’t love city living as much as I do. I point out to them – see, Toronto has these bucolic places in the middle of the city! So far, they’re all suitably impressed. This place is so well used by such a variety of people (and dogs) that I’m always pleasantly surprised. It’s dog-walking central in the mornings and weekends. The off-leash areas are a major draw although most dogs head straight for the creek that runs through the park and leap right in. As a non-dog person I’m always jumping out of their drenched way when they emerge from the water and chase their canine playmates. The many dog walkers (both professional and amateur) all know each other and spend much time exchanging important dog and personal information. It almost makes me want a dog – but umm… no. Then there are the yoga mommies. A dozen or so young women with jogging strollers full of babies and Yoga mats routinely troop down to a grassy area to stretch and bend. They also work on their cardio by running up and down a steep set of stairs near the entrance of the park. When I first noticed this I was taken aback since all I saw was a group of abandoned strollers, with babies inside, at the bottom of the stairs. Shortly, and just before I reached to make a 911 call, the mommies came bounding down the stairs, cooed to their babies then ran up again. I was relieved. There are also lots of groups of kids in the park: from daycares, summer camps, biology classes. Many mornings I see piles of knapsacks left unattended while the kids are off examining plants and water creatures. A testament to the usual safety of the city. Kids, dogs, young people, older people, all reflecting the faces and diversity of Toronto can be found in this out of the way public park. So if you’re ever in the neighbourhood, pop in for a little woodsy walk and maybe a wet dog nuzzle. 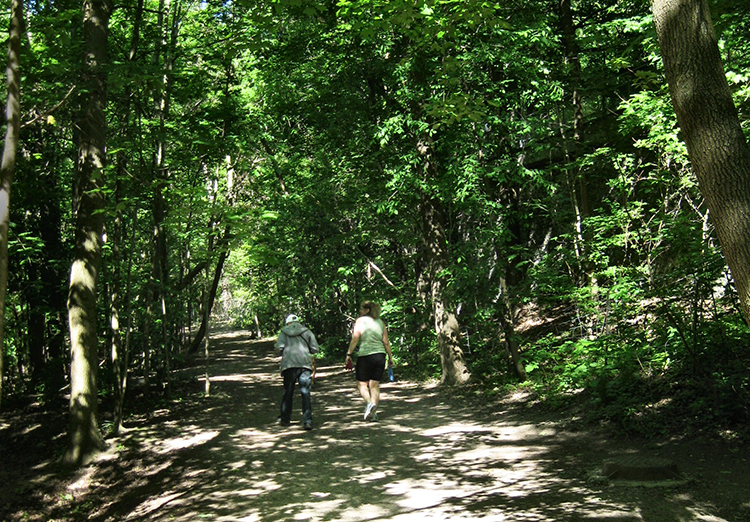 The City of Toronto has a variety of interconnected parks throughout the various ravines, and there are downloadable guides available for each of the Discovery Walks. If you follow the Northern Ravines self-guided walk, you connect with the Blythwood, Lawrence Park and Chatsworth Ravines, as well as the Alexander Muir Memorial Gardens and Sherwood Park. These watersheds do not follow straight lines, and if you explore further, you may be surprised at what you find at the top of those steps. 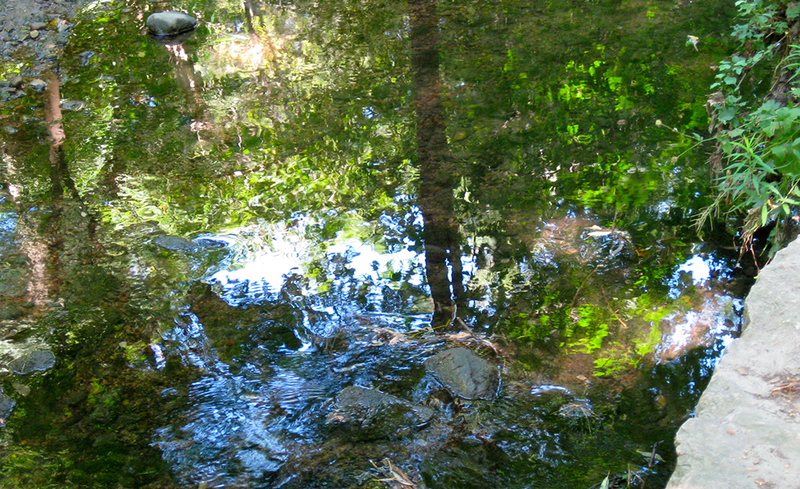 You may also be surprised to see your favourite stream disappear into huge a culvert. In our haste for modern infrastructure, we didn’t really make much provision for natural creeks. The effects of Hurricane Hazel forced a review. Much of what remains for us to enjoy today is the result of someone’s foresight, or another’s tireless activism. The City publishes a Toronto Cycling Map, which provides a good overview of the entire trails system. Hard copies are available free of charge. 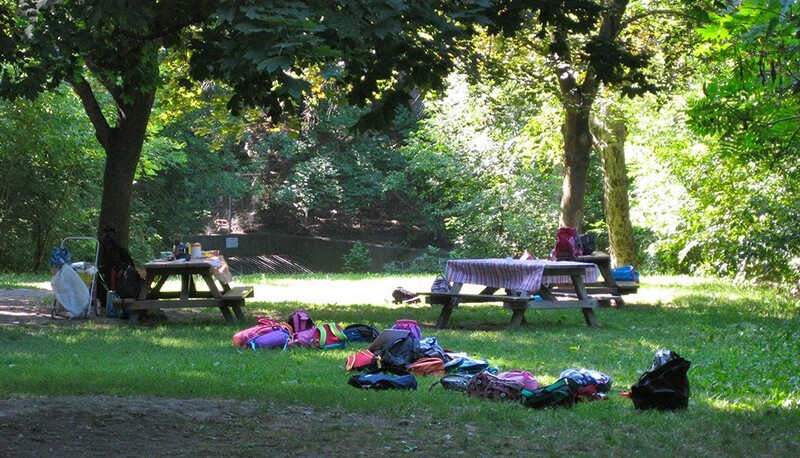 Also, I chanced upon a charming and informative Blog written by Jason Ramsay-Brown, in which he chronicles his adventures with his young daughter: Toronto Ravines & Trails with Abbey.